The recent issue of Imprint magazine featured 2 full page articles about projects we’ve been involved in. 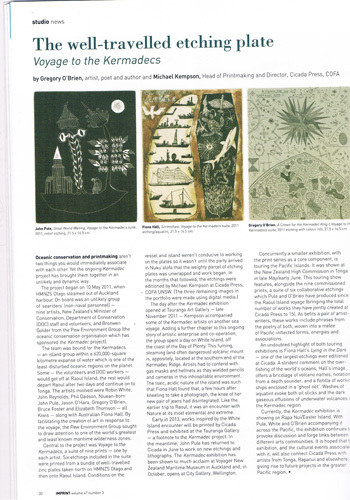 The first article, written by Gregory O’Brien and Michael Kempson, describe a project which saw a group of NZ artists head over to the Kermadec Islands where they went about working on their etching plates. The second article, written by Tess Allas and Michael Kempson, is about the Aboriginal printmaking workshops we’ve been having at Cicada Press over the past years – including artists such as Vernon Ah-Kee, Gordon Hookey, Fiona Foley, Reko Rennie and many more. For those of you who don’t know, Imprint Magazine is the official magazine of the Print Council of Australia. 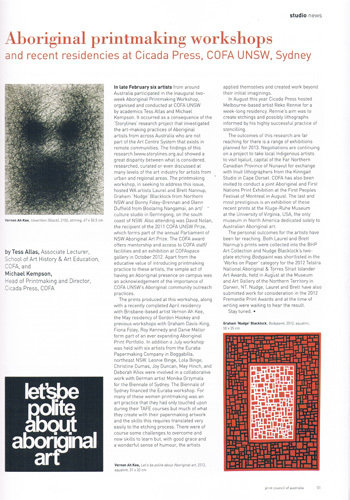 For only $50 a year you can become a member, receive the magazine and support the Australian printmaking community. Highly recommended, Join NOW!